In the weeks and days leading up to Christmas there's a lot of fun and exciting activities to do that fill up young child's mind and time. They get to decorate the tree, make gingerbread houses and treats, make festive cards, write up their Christmas wish list, and above all else, visit Santa Claus! Paying Santa Claus a personal visit and chatting with the jolly old fellow is a cherished memory that many people fondly recall from their childhood. The age old tradition is replayed year after year at the countless Christmas attractions throughout the country. Little kids wait in line excitedly with their parents for the chance to sit and talk with Santa and from a youngsters perspective it's simply magical. For one little boy, his meeting with Santa was beyond magical, and it has since turned unexpectedly into one of the most heartwarming scenes of the season. 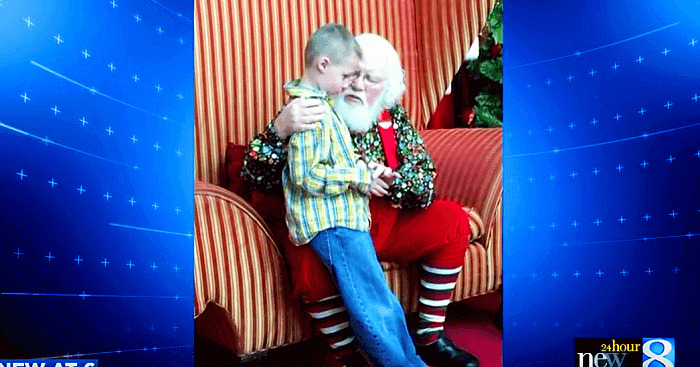 It took place at the RiverTown Crossings Mall in Grandville, Michigan, when Naomi Johnson took her son Landon and his four cousins to meet Father Christmas. When it was Landon's turn to sit on Santa's lap he told him that he wanted a Wii, a remote control car, and a cool toy dinosaur for Christmas. After posing for a picture he hopped off, but that wasn't the end of the conversation. The simple response from Santa's heart straight to Landon's ears, “It's OK to be you” was all that he needed to hear. It's what his mother had been telling him all along and what we all need to hear and remember. No matter what personal obstacles we face and go through in life, whether it be Autism or some other health or mental condition, whatever it may be, we have to remain true to ourselves. Santa definitely made his meeting with Landon an unforgettable one, not just for him but also for people around the world. Ever since a news story about it was posted online, it has gone on to touch the hearts and lives of countless viewers who say that the footage is inspiring and gives them hope. Check out the accompanying video for more on the beautiful story and try not to cry because it truly is one of the most simple yet touching clips of the holiday season.